I'm so excited to announce that I'll be collaborating with Pebeo Paints for the upcoming Cocoa & Hearts paintings! You'll see these gorgeous paints in action if you purchase an upcoming piece! If you want to know when the new paintings will be added, be sure to add your email to the mailing list on the Cocoa & Hearts homepage! 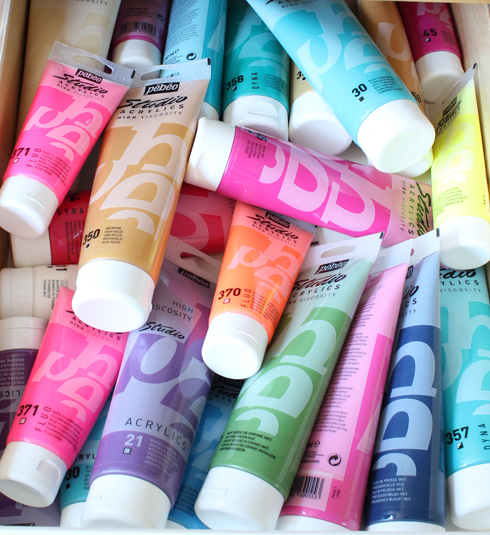 Have you ever tried Pebeo Paints?? They're beautiful! These look like super fun colours! never tried them, but they do look vibrant and gorgeous! Oh I haven't, Jen! I'll have to give them a try! I love their color range. How is the consistency?